While this attack and others like this shock the world, it is governments, as well as the media itself on occasion, that have been at the vanguard of banning free expression and regulating ideas in recent years. The French government has demonstrated its censorious and anti-Enlightenment outlook by banning Muslim women from wearing the veil in public, for example. Meanwhile, in the UK, the past year has seen an art exhibition in London shut down and a public debate on abortion cancelled at the University of Oxford. In the wake of the Paris attack, it will be interesting to see how leaders react. Barack Obama, for instance, recently defended the right of film makers at Sony to poke fun at the North Korean President Kim Jong Un and accused North Korea of orchestrating a cyber-attack against the company in an attempt to stifle its freedom of expression. 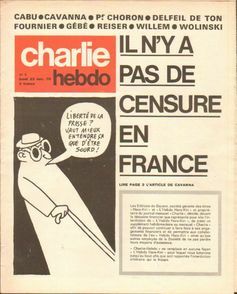 Whether or not he will be willing to come to the defence of Charlie Hebdo in such an absolute and uncompromising manner remains to be seen. Indeed, it is our confusion over such matters that have acted as a green light to others to take action. Just 25 years ago, Iran’s Ayatollah Khomeini was reviled for issuing a Fatwa against author Salman Rushdie for his controversial novel The Satanic Verses. Today, it would seem as though much of Western society has embraced similar regulatory impulses through the form of self-censorship – holding back from expressing views even before anyone demands it. Clarifying these confusions for ourselves will be the first necessary step towards avoiding such incidents again in future. Rather than living in fear, we must stand robustly against anyone who would stifle freedom of expression – be they governments, other authoritative bodies including arts institutions and universities, the media or a handful of self-appointed and readily-offended fools. In recent years a therapeutic culture has emerged across all Western societies that effectively seeks to prioritise our emotions or how we feel about things over reasoned debate and objective insight. As a consequence, a generation has emerged that is more readily offended than its predecessors. Within this generation, a tiny minority is encouraged to act and sometimes does so violently. They are only encouraged by mainstream confusion and equivocation on such issues. Freedom of expression is absolute or it is nothing at all. It cannot be parcelled out so that we are only free at particular times or in specific circumstances. That’s how it becomes a privilege rather than a right. That’s how the self-appointed guardians get to decide what is an isn’t acceptable. Unpalatable as it may be on occasion, we all have the responsibility to engage robustly with those we dislike, or even despise. We have to do it in a manner that excludes violence and encourages discourse, debate and clarification. It seems we have moved a long way from the apocryphal saying attributed to the French Enlightenment philosopher Voltaire: “I disagree with everything you say but I will defend to my death your right to say it.” An over-sensitive culture has emerged, not in some far-away place but right here in the West. Violent attacks like those in Paris are still rare but this is a culture that will engender many future acts of conflict unless we regain the real sense of what tolerance means. It is not indifference to others or turning a blind eye but healthy, pointed and, on occasion, offensive engagement.